VESAK FESTIVAL of LIGHT at The Great Stupa of Universal Compassion. Lotus painting in the living room. 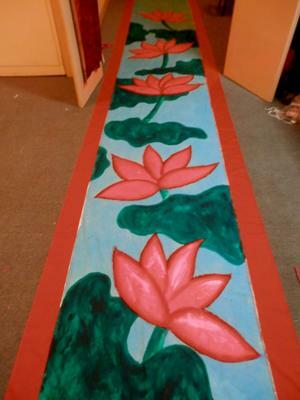 Lotus painting down the hallway!! Here I am in Bendigo as Artist-in-Residence at La Trobe University - Bendigo campus for the year…with an exciting project collaborating with the Bendigo Art Gallery, for a special Gold-Dragon-Bush fashion-performance extravaganza on September 14 to open the Bendigo Fashion Week. These new and recycled works are inspired by Bendigo and its unique surrounding forest ..the Gold mining and the rich Chinese history. My collection of 1920’s Chinese Opera costumes will be remade with a reverence to the past. One of the most marvellous events to happen at this time of living in Bendigo was the VESAK FESTIVAL of LIGHT at the GREAT STUPA on the 25 May…located near the Atisha Buddhist Centre and Thubten Shedrup Ling Monastery. 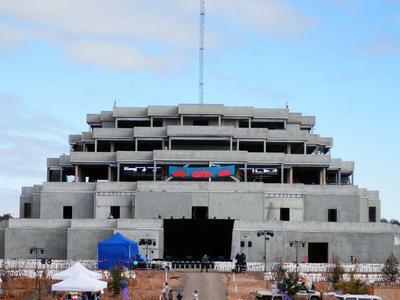 The great Stupa of Universal Compassion will be the same size and design as the Great Stupa of Gyantse in Tibet.and this building will be finished in 2015. 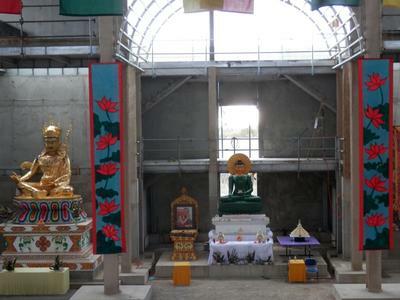 I volunteered to help with the decorations of the Great Stupa for the festival…inspired by Buddhas birthday……together with the team we planned the colourful banners and flags to hang inside the basic concrete building and I painted a pair of 6 metre long Lotus banners to hang either side of the Guru Rinpoche Padmasambhava statue. Outside along the pathways we hung lots of prayer flags and lanterns. I have always had a lovely Lotus connection, floating on Yellow Waters and Red Lily lagoon in Arnhem land many years ago…and it was such an honour to be involved with such a special occasion! 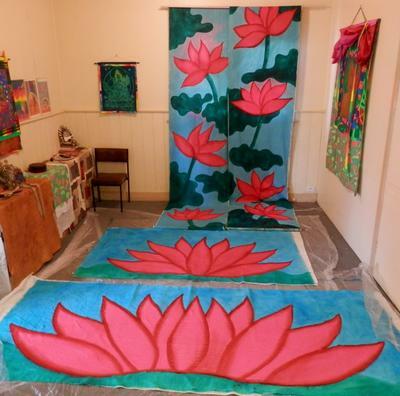 I also painted a giant trio of Lotus flowers that glowed in the afternoon light…many layers of pink fluorescent paint certainly helped… on the outside of the Stupa. 8,000 people visited that day…it was certainly amazing..with a light and lantern procession, Chinese lion dancing, Vietnamese Lotus dancing and fabulous fireworks to end the night.